The morning after my sunset photo shoot in San Francisco, I was up bright and early to spend the day exploring the city on foot. I began at Pier 1 on the Embarcadero, meandered through the area around Fisherman’s Wharf to Ghirardelli Square (where I enjoyed a salted caramel sundae thankyouverymuch), and ended up an hour before sunset on the Municipal Pier at Aquatic Park with its sweeping views of Alcatraz and the Golden Gate Bridge. I don’t know how far I walked, but the stars were shining when I finally made my way back on my last legs to the Wharf in search of a taxi. To the driver who rescued me, I am forever grateful. 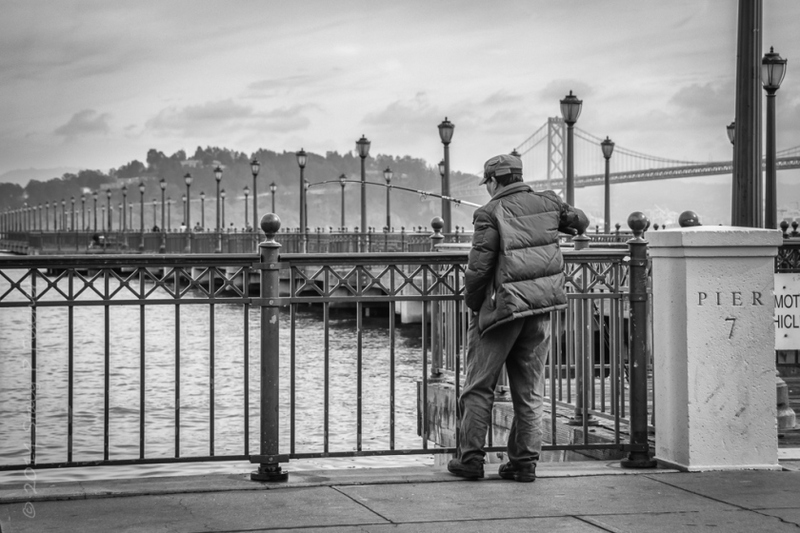 To this fisherman at Pier 7, thanks for the great photo op! Visit VisualVenturing.com for more of my work.